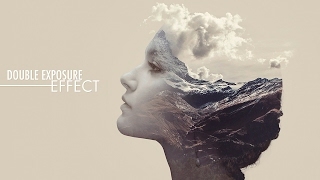 Double Exposure Effect - Photoshop Tutorial. Как сделать в Фотошопе? In this tutorial, we'll see how to create a wonderful double exposure effect using two different images and blending them together in Adobe Photoshop CC 2017. the main idea for this tutorial is to know how to quickly blend images together using blending modes and layer masks, to end up with some awesome results. ——➤IMPORTANT: Any stokes are used for preview and tutorial purposes only. in case you want to use it you need to read the rules from the owners of this stocks. Hello Everyone in today's video I will show you how I created this double exposure effect image that you can see in here using Adobe Photoshop alright, fantastic so! LET'S GET TO IT!!. Alright, I'll go ahead and open Adobe Photoshop I'll take the image I'll be using and open it in here now I need to make a selection of the model so I'll go and select the quick selection tool and I'll make a quick selection of the model portrait just like this and then, while I'm still in the quick selection, I'll right click and choose feather and I'll put 0.5px feather in here and press OK alright, now I'll select the model image and I'll press CTRL+J and now I have it in a new layer I'll name it Model let me delete this one in here alright now, I want to make the background of this image bigger so we'll have enough space to create our effect. So I'll go and select the crop tool and I'll expand it a little bit from here and in here and I'll click on this check mark to commit my change alright, now I'll go to adjustment in here and I'll choose Solid Color I'll keep the color white for now, and I'll press OK I'll take it and put under the model layer and I'll name it BG for background alright, now I'll select the model layer and I'll desaturate it, so I'll press CTRL+SHIFT+U or you can go to: Image, Adjustment and choose Desaturate. Now, I'll go and open the second image I'll be using I'll take it and open it in a new tab and I'll drag it to the other tab in here I'll name it Mountain and I'll change it opacity around 50% this way I can see where I want to replace it before I'll start working on it now I know that I want these clouds to be in the other direction. So I'll press CTRL+T and then I'll right click and choose Flip Horizontal and now I have the clouds where I want them also I want this top of the mountain to be right in the forehead of the model in here so I'll press shift and drag to make the image bigger and I'll replace the image to fit where I want it and I'll one click on this check mark and I'll change the opacity back to 100% now I'll select the model layer and I'll press CTRL and on click on it to load the selection of the model now I'll select the mountain layer and then I'll one click on this layer mask icon and as you can see this will create a silhouette of the model alright, now I'll make a copy of this model layer so I'll press ALT and make a copy of it and put it on top of the mountain layer. And I'll change it blending mode to Lighten and we'll get a cool effect in here but I'll reduce the opacity of it around 50% now I'll apply a layer mask on it so I'll go and I will one click on this layer mask icon and I'll select the layer mask in here and then I'll select the brush tool with a 40% in the opacity and the black is my foreground color and I'll start deleting in this area. Alright, now I'll select the mountain layer and I'll make sure that I'm on it layer mask and I'll start deleting in here to reveal the face of the model. Alright, now I'll select the BG layer and I'll double click on it and I'll sample a color from here and I'll press OK now I'll select the mountain layer and I'll press CTRL+J to duplicate it and then I'll take the layer mask and delete it and I'll change it blending to Lighten and as you can see this will create a cool effect with the clouds. But there are still other part from the image visible so I'll apply a black layer mask on it by holding ALT on my keyboard and one click on this layer mask icon. Now I'll select my brushes and with white as my foreground color and I'll start brushing in here to make only this part of the clouds visible. Alright, now I'll select this top layer and I'll go to adjustment and choose solid color and I'll pick a soft pink color and I'll press Ok I'll change the blending mode to Multiply and I'll set the opacity around 20% now I'll create a stamp visible layer so I'll press ALT+CTRL+SHIFT+E and I'll desaturate it so I'll go to: Image, Adjustment and choose Desaturate. I'll change the blending mode to Soft Light and I'll put down the opacity around 30% and that's it So I hope that you enjoyed and liked this tutorial and it was a little bit helpful for you don't forget to SUBSCRIBE and COMMENT give it a thumb up and share it and wait for more tutorial to come in fact in the next tutorial I'll show you how I created this other double exposure image that you can see in here.